Since I haven't had too much of interest to show you lately, I thought I'd remind you that you can search this blog. I have been so impressed with how good Blogger's search feature works. The search I'm referring to is the box in the upper left corner. You have to scroll to the top of the page to see it. It's directly after the orange Blogger logo and just before the words, "Search Blog". If you don't see it, watch the Video Tour of Blog (link in right sidebar) and I'll show it to you. This feature has been available for a long time, but it works so much better now with the 'New' blogger. It must be connected to the underlying database of posts because it's so fast and accurate. So, give it a try! Just click in the box next to the Orange B and type Redwoods, then press Enter, or click on 'Search Blog'. You should quickly see a message "Showing posts for query redwoods." The first 2 posts simply mention Redwoods in another context, but if you scroll down, you'll get to the post with photos of the redwoods. Or try searching for Buckminster Fuller. You will quickly be taken to our post about a visit to the Ford Museum to see the exhibit on Buckminster Fuller's Dymaxion house. The only problem is that the search is very precise. For example, enter 'chiricahua' and click 'search blog' and you will be rewarded with posts that mention Chiricahua National Monument. But, if you misspelled it and typed in Chiricajua, you'd get a message "No posts match your query". So, you might try "National Monument". However, even though you will see some results with this search, you won't see Chiricahua because I referred to it as a Nat'l Monument! Have fun, and let me know what you find! Three months ago, I bought a brand new Toshiba laptop computer. I thought you might like an update on how I like it. Well ... it's fine, but I wish I had bought the Sony. Three years ago, Jim bought a brand new Sony Vaio. He has been SO happy with that Sony Vaio! Number one - it has the best built-in Wi-Fi that we've seen anywhere. When other computers can't see a signal at all without plugging in an external USB adapter, Jim can not only see it, but successfully connect and stay connected! The second, special feature about his computer is that the screen is clearly viewable outside in sunlight. I have no idea if the current batch of Sony Vaios would be the same, but it seems a good bet. But, Toshiba is a very good name in laptops, and we figured that built-in Wi-Fi adapters had all caught up by now. Nope. Our computers can be sitting side by side - he can connect no problem and I can't. I have to plug in a USB adapter. No big deal, just agravating. And, my monitor is very 'normal' when I'm outside. Meaning, I can't use it outside. My computer is also hanging up and crashing more than I expected. I doubt this has anything to do with the computer itself. It has to do with using Windows Vista. I normally advise not to jump on board with a new operating system until it's been out for 6 months or so. I bought this laptop the first week that Vista was released. And, I use some software like Dreamweaver 8 that is not fully compatible with Vista. Oh well, that's what you get for being on the bleeding edge. I still would not recommend anyone buy a new computer without the latest operating system. Now for the good stuff. It's great at video! And, that's one of the main reasons I bought it. As you know, this blog is full of photos and that's the way I like it. I see video as the next major direction for computers and Websites - and I want to be on board. Helping my Mom edit her video got me started. This computer is fast for importing video, and the moviemaker software that comes with Windows Vista is equally fast, easy, and impressive. This computer also has *lots* of hard drive space for storing video. It takes about 12 gigabytes (1 gigabyte = 1,000 megabytes! )per hour of video. You can expect more video from us now. A couple of minor items I really like: 1. The computer's volume control is a little wheel, right in the front of the computer. No messing around with your mouse looking for the Control Panel software to manage your sound. Want to turn it up? Just reach out with your thumb and turn the dial. 2. The fingerprint reader. I thought that was going to be a total waste, but I love it! When my computer first comes on, it asks for a password. I don't have to type anything, just run my finger over the little glass window below the keyboard. I also have several websites I visit that require a username and password. I fill it in manually once and then swipe my finger. From then on, all I have to do is swipe my finger and the computer logs me in! So, I've recorded lots of usernames and passwords, but anyone who wanted access would have to have my fingerprint. Pretty cool. OH! I *Love* my two monitors. How did I ever live without that? I can have my online bank statement displayed on one screen, while I balance the checkbook on Quickbooks on the other screen. Or, I can be answering an email about 'how do I ...' with the email on one screen and the application in question on the other. I'm seeing what I'm talking about, and talking about it at the same time, without having to switch windows back and forth. I know this has nothing to do with my new computer, it's just that, rather than throw out the monitor I had with my old computer, I now have two. You can see photos in the previous blog post. Here is a 2 minute video on our weekend. As if you haven't seen enough photos of Odie :-} Now we have a video camera! As we were driving up I-95 on our way to visit Jim and Susan, my Mom asked, "so tell me how you know them, how did you meet?" Well, we haven't met them yet! Ya gotta love RVers! We've only communicated via email, yet they opened their home to us. We had a great time getting to know them, the conversations just kept going and going and going. We will meet again! Here they are: Notice the For Sale sign. You can see more details by going to this cool website that they are developing: RVResortsByOwner.com. Click on the link to The Great Outdoors and you'll see their house .. 118 Dragonfly. We left on Sunday and went to Jonathon Dickinson State Park which is just north of West Palm Beach. We've been to this park many times over the years, and it's always lovely. Jim had to spend the first hour after we parked getting all the love bugs cleaned off! Here's the view our site. It was so much fun having Mom along. After all, she and my Dad are the ones who taught me about life on the road at an early age. 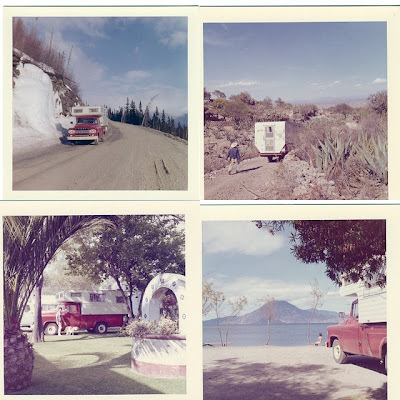 My first RV trip was in 1962 in a truck camper. We were living in Alaska and they got cold! So we loaded up a truck camper and headed south, making it as far as Guatemala. Here are a couple photos that have survived from that 3 month trip. 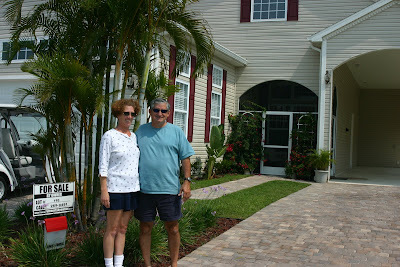 Susan and Jim invited us to visit them in Titusville, FL. We thought we would be stopping by on our way out of Florida, but, as you know, we haven't left Florida! So, we decided to make a weekend of it. When we picked the dates of May 12-13 and noticed it was Mother's day, that gave us the idea to invite Mom to come along. On the road again! Watch out for the Florida Love Bugs! Here we are parked in the 'RV Port' of Susan and Jim's house at The Great Outdoors. We arrived just past happy hour time, so we poured our glass of wine and borrowed their golf cart for a spin around the park. Parts of the park are simple RV pads. And other parts are luxury homes with RV Ports. There's even a dog park which Odie enjoyed. And, Mom has always liked small, cozy places, so she's right at home in our 'guest room'! Here she is reading the manual of her new video camcorder. We are fulltime RVers, but we're not doing too much traveling at the moment, as I'm sure you've noticed! I'm getting my traveling fix by watching the Blogs of other RVing friends like Gundyville and Diandy. The Gundys are traveling thru Wyoming and Montana, visiting places that we've been and their blog is evoking my memories. Diane and Andy are in New Mexico, but seeing places we didn't go to. I'm making mental notes to add these places to our itinerary next time we're there. It's good to have a 'domestic' period, I guess. We're spending some time with family. It's amazing to see little AJ grow so fast. He's starting to crawl. On a daily basis, Jim is 'workcamping' in the office here at the park. That's great because it means we have no site fees. And, I need this kind of time to concentrate on learning Coldfusion. That's the web programming language that I use to make dynamic websites. It's not easy and I need focused, concentrated time to build my skills. We're also making some changes in the motorhome. We've always been envious of RVers who have pantries! We've been putting our canned goods in the space underneath the dinette bench. Lynne suggested that the linen closet next to the shower would make a good pantry. hmmmm, ok. Then, where do we put the towels? Jim mounted this nice little rack behind the toilet. We are going to take a little road trip this weekend. Susan and Jim, who attended our seminars at the FMCA convention in Georgia, invited us to come visit. They have a house with an RV 'port' in a big park in Titusville called The Great Outdoors. We're looking forward to seeing it. And, since this happens to be Mother's Day weekend, my Mom is going with us! Let this be a lesson to you. If you invite us to visit ... we do! There are major brush fires happening in central and western Florida right now, and the wind seems to be just right to blow all the smoke our way. Sure makes for a dramatic-looking sun. This is sunrise ... not sunset! What are we doing up early enough to see sunrise, you might ask? Well, Bill, the manager here has been walking every morning for the past year or so. He convinced Jim and me to join him. So, we're up and walking at 7am! Jim and Bill walk a 3.5 mile route. Odie and I do about half of that. I'm confident of the mileage because I used Google Earth to measure it. I used the same technique that I recorded in this video about Peace River. Every year around this time, the Air and Sea Show comes to town. I get a kick out of seeing these fantastic machines tearing up the skies. It's also an excuse to have a party. Our friend Glennuba used to own a condo in a high-rise on the beach. He still has friends there who invited us to share food and drink and an excellent view of the event. Thanks Scott and Carrie for your hospitality. Last year we were part of the spectator fleet, anchored off the beach. It seemed like there were fewer boats out there today, although the weather was nearly perfect. Sunday looks like another perfect day for the event. Here is the B2 Stealth bomber. Here is an A-10 pulling some G's There were several Heritage Flights. The F/A-22 Raptor can perform amazing manoevers. The Air Force Thunderbirds were the grand finale. A couple weeks ago I wrote about our cell phone bill. I got a lot of email on that, *all* in favor of sticking with Verizon. That was enough for me. The rollover minutes with Cingular/AT&T aren't enough to tip the scale. We're sticking with Verizon because the coverage and service IS better among our circle of friends and business contacts anyway - and that's what counts. I still want to reduce our monthly bill. It's silly to pay for 1400 minutes/month when we only use 4-800. Unfortunately, the next step down is 700. I wish they had a 900 plan, that would be perfect. They did offer me a 'promotion' of 1500 'bonus' minutes. That should work pretty well. So, I switched to 700 minutes/month and re-upped for another year contract. If we go over 700, we'll dip into the 1500 bonus minutes rather than going over the contract. That will give us enough leeway to make it work. The north end of Fort Lauderdale beach will remain open to kayakers, surfers, fishermen and divers. Whew! We're so glad. Thank you Mayor Jim and City Council!